Above: Marine Life Park will be the last of the 12 headline attractions launched at Resorts World Sentosa. Resorts Wold Sentosa will host the world’s largest oceanarium when it opens on December 7. Housing about 100,000 marine animals in some 60 million liters of water, the Marine Life Park will have two major attractions—offering visitors the choice between getting wet or staying dry. 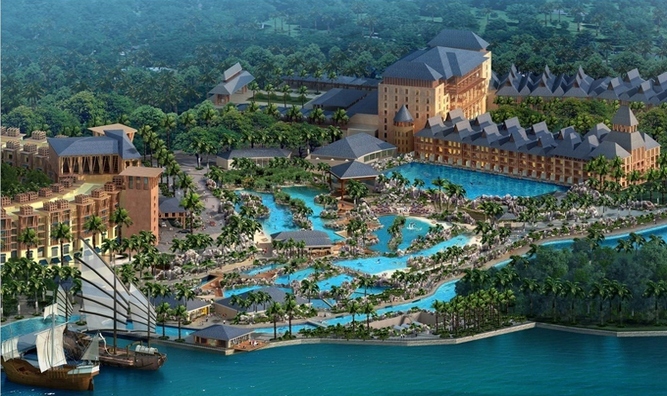 Adventure Cove Waterpark will feature a “hydromagnetic coaster,” which will propel riders upstream around a series of twists and turns, as well as a wave pool with 16 variations of waves, and a house reef where guests can snorkel with fish. Visitors to the Southeast Asia Aquarium will be able to view hammerhead sharks, manta rays, and hundreds of other marine life through the world’s largest viewing gallery.